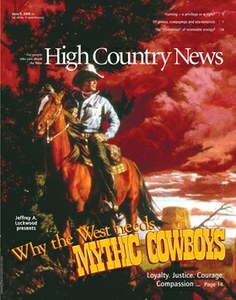 Jeffrey Lockwood believes that the modern West could use an infusion of old-fashioned Cowboy Mythology. Navajo weaver Marie Begay makes beautiful rugs from the wool of the sheep she raises, and looks forward to spending the money she earns at Wal-Mart. After a herd of wild horses is massacred in Nevada, Deanne Stillman ponders the bones in the desert. Biodiesel pirates; dinosaur bones for sale; archaeological developments; hot weather and cool bankrobbers; what to do with a big dead moose. Just because you disagree with someone about energy drilling or off-road vehicles doesn’t mean your opponent is a communist pinko – or an eco-terrorist. Garry and Diann Fulks have been recycling large metal objects for 35 years at their scrap yard in Montrose, Colo.
Los Angeles needs green power, but some environmentalists are up in arms over plans to build transmission lines across the Mojave Desert. On public lands throughout the West, hikers, bikers, horseback riders and off-roaders compete for trail space, while beleaguered land-managers struggle to come up with workable forest management plans.